To enable automatic updates, login to admin panel and click on License and Info > Automatic Updates, tick off automatic updates enabled. Automatic updates is a convenient tool that will maintain your marketplace and ensure you have the latest fixes for your marketplace, this feature was added in build 542 so you'll need to be running build 542 or higher. This feature saves the time it would take to perform manual upgrades on the marketplace. You can enable automatic updates and have the software automatically upgrade itself to the latest published version available. NOTE: If you intend to customize, add new functions, payment gateways, change design etc. the auto updates feature should remain OFF to avoid over writing any custom development when the live update service is running. Where do I found my IP address? Recently added for convenience, you can now find your IP address from the Automatic Update Log, simply copy and paste in the IP address field when you download. 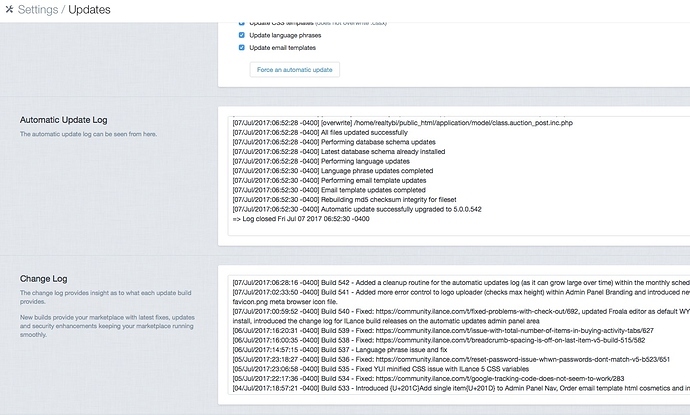 We also have a new automatic updates interface to help understand what's going on with the updates to see the log of changes and/or additions. As well as being able to "Force an automatic update" without having to wait 24 hours and you will have details such as dates when everything has occurred plus the current version build the marketplace is on.